Settlement in the Gates County area began in 1660. Residents of early rural communities made a living by farming and lumbering. In the early 1700s, Hunters Millpond was built at the head of Bennetts Creek to provide a means of processing and marketing regional produce. Highway construction destroyed this millpond in 1922. But further downstream, Norfleets Millpond, which was built in 1811, thrived. Gristmills, a sawmill, a farm supply store and other enterprises made the pond area the center of trade and merchant activity in Gates County. Thus, the pond later became known as Merchants Millpond. The 760-acre millpond is more than 190 years old and has developed into complex, mature ecosystems. Towering bald cypress and tupelo gum trees, displaying growths of Spanish moss and resurrection ferns, shade the pond's dark, acidic waters. Numerous species of aquatic plants, such as the floating yellow cow lily and the submerged coontail, thrive in the pond. A red and green layer of floating duckweeds and water fern often covers the water's surface. Moved about by wind and current, these floating mats create a changing mosaic of colors and patterns. At the upper end of the millpond is Lassiter Swamp, an ecological wonderland containing remnants of an ancient bald cypress swamp - an eerie "enchanted forest" worthy of a fairy tale. Mistletoe has twisted and gnarled the trunks and branches of tupelo gum into fantastic shapes. Surrounding the aquatic communities is an unspoiled wilderness. Stands of American beech highlight a mixture of pine and hardwood forests. The diverse habitats in the park support a variety of animals. Wetland wildlife is particularly abundant. Frogs thrive in the aquatic environment of the millpond, and spring and summer rains bring a mixed chorus of carpenter frogs, leopard frogs, bull frogs, cricket frogs and species of tree frogs. Several species of pond turtles, often called cooters or sliders, bask on warm logs and stumps while the snapping turtle makes easy prey of other aquatic creatures. Water snakes are plentiful. Most of them are harmless, but the venomous cottonmouth is also present. In addition to game fish, two primitive species of fish -- the long-nosed gar and the bowfin -- inhabit the millpond. These interesting species have remained relatively unchanged for millions of years. Both the gar and the bowfin are large and important predators in the blackwater habitats of the coastal plain. More than 200 species of birds, ranging from graceful egrets to turkeys and owls, have been recorded in the park. Spring and fall bring migrations of swamp warblers, parulas, prothonotaries and yellow-throated warblers. In winter, a variety of waterfowl stop by on their journey south. Lucky visitors may catch a glimpse of the beautiful hooded merganser, a small fish-eating duck whose males flaunt a magnificent black-bordered white crest. Pileated woodpeckers, barred owls, and red-shouldered hawks also enjoy the swamplands. Paddling on the pond or creek is a great way to see several species of interesting mammals. Though beavers themselves are rarely encountered, dams, lodges, and teeth marks attest to their presence. Mink, river otter and bobcat are occasionally spotted. Deer, raccoons and opossums are also in residence. Bats roost in clumps of Spanish moss and are often visible at dusk when they dip to the surface of the pond to drink. North Carolina Division of Parks and Recreation. Merchants Millpond State Park. http://www.ncparks.gov/merchants-millpond-state-park (accessed December 8, 2015). Resources on Merchants Millpond, North Carolina Digital Collections, http://digital.ncdcr.gov/cdm/search/searchterm/merchants%20millpond/fiel... (accessed December 11, 2015). Puterbaugh, Parke, and Jennifer Derby. 1997. Southeastern wetlands: a guide to selected sites in Georgia, North Carolina, South Carolina, Tennessee, and Kentucky. [Washington, D.C]: U.S. Environmental Protection Agency. Williams, Floyd K. 1993. Leave It to Beaver. Merchants Millpond State Park: An Environmental Education Learning Experience Designed for Grades 4-6. North Carolina Division of Parks and Recreation, P.O. Box 27687, Raleigh, NC 27611-7687. North Carolina. 2008. Merchants Millpond State Park. [Raleigh, N.C.]: N.C. Division of Parks and Recreation. 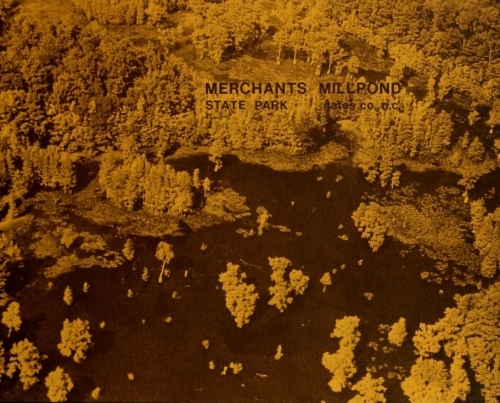 [Mechants Millpond.] Photograph. ca. 1970s. From Merchants Millpond State Park Master Plan. N.C. Division of Parks and Recreation, 1979. https://archive.org/details/merchantsmillpon00unse (accessed January 2, 2015). [Aerial photograph of Merchants Millpond]. Photograph. ca. 1970s. From Merchants Millpond State Park Master Plan. N.C. Division of Parks and Recreation, 1979. https://archive.org/details/merchantsmillpon00unse (accessed January 2, 2015). We saw a swan there over the weekend. Was this a migratory left over, or are there year round swans in residence? I hope this helps, if not please feel free to post back.